"Versailles" redirects here. For the city of Versailles, see Versailles, Yvelines. For other uses, see Versailles (disambiguation). The Palace of Versailles (French: Château de Versailles; English: /vɛərˈsaɪ, vɜːr-/ vair-SY, vur-; French: [vɛʁsaj]) was the principal royal residence of France from 1682, under Louis XIV, until the start of the French Revolution in 1789, under Louis XVI. It is located in the department of Yvelines, in the region of Île-de-France, about 20 kilometres (12 miles) southwest of the centre of Paris. The palace is now a Monument historique and UNESCO World Heritage site, notable especially for the ceremonial Hall of Mirrors, the jewel-like Royal Opera, and the royal apartments; for the more intimate royal residences, the Grand Trianon and Petit Trianon located within the park; the small rustic Hameau (Hamlet) created for Marie Antoinette; and the vast Gardens of Versailles with fountains, canals, and geometric flower beds and groves, laid out by André le Nôtre. The Palace was stripped of all its furnishings after the French Revolution, but many pieces have been returned and many of the palace rooms have been restored. In 2017 the Palace of Versailles received 7,700,000 visitors, making it the second-most visited monument in the Île-de-France region, just behind the Louvre and ahead of the Eiffel Tower. The site of the Palace was first occupied by a small village and church, surrounded by forests filled with abundant game. It was owned by the Gondi family and the priory of Saint Julian. King Henry IV went hunting there in 1589, and returned in 1604 and 1609, staying in the village inn. His son, the future Louis XIII, came on his own hunting trip there in 1607. After he became King in 1610, Louis XIII returned to the village, bought some land, and in 1623-24 built a modest two-story hunting lodge on the site of the current marble courtyard. He was staying there in November 1630 during the event known as the Day of the Dupes, when the enemies of the King's chief minister, Cardinal Richelieu, aided by the King's mother, Marie de' Medici, tried to take over the government. The King defeated the plot and sent his mother into exile. Louis XIV first visited the château on a hunting trip in 1651 at the age of twelve, but returned only occasionally until his marriage to Maria Theresa of Spain in 1660 and the death of Cardinal Mazarin in 1661, after which he suddenly acquired a passion for the site. He decided to rebuild, embellish and enlarge the château and to transform it into a setting for both rest and for elaborate entertainments on a grand scale. The first phase of the expansion (c. 1661–1678) was designed and supervised by the architect Louis Le Vau. Initially he added two wings to the forecourt, one for servants quarters and kitchens, the other for stables. In 1668 he added three new wings built of stone, known as the envelope, to the north, south and west (the garden side) of the original château. These buildings had nearly-flat roofs covered with lead. The king also commissioned the landscape designer André Le Nôtre to create the most magnificent gardens in Europe, embellished with fountains, statues, basins, canals, geometric flower beds and groves of trees. He also added two grottos in the Italian style and an immense orangerie to house fruit trees, as well as a zoo with a central pavilion for exotic animals. After Le Vau's death in 1670, the work was taken over and completed by his assistant François d'Orbay. The main floor (above the ground floor) of the new palace contained two symmetrical sets of apartments, one for the king and the other for the queen, looking over the gardens. The two apartments were separated by a marble terrace, overlooking the garden, with a fountain in the center. Each set of apartments was connected to the ground floor with a ceremonial stairway, and each had seven rooms, aligned in a row; a vestibule, a room for the guards, an antechamber, chamber, a large cabinet or office; a smaller bedroom, and a smaller cabinet. On the ground floor under the King's apartment was another apartment, the same size, designed for his private life, and decorated on the theme of Apollo, the Sun god, his personal emblem. Under the Queen's apartment was the apartment of the Grand Dauphin, the heir to the throne. The interior decoration was assigned to Charles Le Brun. Le Brun supervised the work of a large group of sculptors and painters, called the Petite Academie, who crafted and painted the ornate walls and ceilings. Le Brun also supervised the design and installation of countless statues in the gardens. The grand stairway to the King's apartment was soon redecorated almost as soon as it was completed with plaques of colored marble and trophies of arms, tapestries, and balconies, so the members of the court could observe the processions of the King. In 1670, Le Vau added a new pavilion northwest of the chateau, called the Trianon, for the King's relaxation in the hot summers. It was surrounded by flowerbeds and decorated entirely with blue and white porcelain, in imitation of the Chinese style. The King increasingly spent his days in Versailles, and the government, court, and courtiers, numbering six to seven thousand persons, crowded into the buildings. The King ordered a further enlargement, which he entrusted to the young architect Jules Hardouin-Mansart. Hadouin-Mansart added two large new wings on either side of the original Cour Royale (Royal Courtyard). 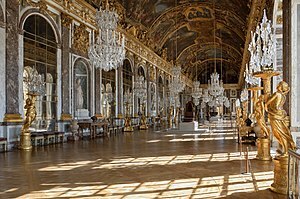 He also replaced Le Vau's large terrace, facing the garden on the west, with what became the most famous room of the palace, the Hall of Mirrors. Mansart also built the Petites Écuries and Grandes Écuries (stables) across the Place d'Armes, on the eastern side of the château. The King wished a quiet place to relax away from the ceremony of the Court. In 1687 Hardouin-Mansart began the Grand Trianon, or Trianon de Marbre (Marble Trianon), replacing Le Vau's 1668 Trianon de Porcelaine in the northern section of the park. In 1682 Louis XIV was able to proclaim Versailles his principal residence and the seat of the government and was able to give rooms in the palace to almost all of his courtiers. After the death of Maria Theresa of Spain in 1683, Louis XIV undertook the enlargement and remodeling of the royal apartments in the original part of the palace, within the former hunting lodge built by his father. He instructed Mansart to begin the construction of the Royal Chapel of Versailles, which towered over the rest of the palace. Hardouin-Mansart died in 1708 and so the chapel was completed by his assistant Robert de Cotte in 1710. Louis XIV died in 1715, and the young new King, Louis XV, just five years old, and his government were moved temporarily from Versailles to Paris under the regency of Philippe II, Duke of Orléans. In 1722, when the King came of age, he moved his residence and the government back to Versailles, where it remained until the French Revolution in 1789. Louis XV remained faithful to the original plan of his great-grandfather, and made few changes to the exteriors of Versailles. His main contributions were the construction of the Salon of Hercules, which connected the main building of the Palace with the north wing and the chapel (1724–36); and the royal opera theater, designed by Ange-Jacques Gabriel, and built between 1769 and 1770. The new theater was completed in time for the celebration of the wedding of the Dauphin, the future Louis XVI, and Archduchess Marie Antoinette of Austria. He also made numerous additions and changes to the royal apartments, where he, the Queen, his daughters, and his heir lived. In 1738, Louis XV remodeled the king's petit appartement on the north side of the Cour de Marbre, originally the entrance court of the old château. He discreetly provided accommodations in another part of the palace for his famous mistresses, Madame de Pompadour and later Madame du Barry. The extension of the King's petit appartement necessitated the demolition of the Ambassador's Staircase, one of the most admired features of Louis XIV's palace, which left the Palace without a grand staircase entrance. The following year Louis XV ordered the demolition of the north wing facing onto the Cour Royale, which had fallen into serious disrepair. He commissioned Gabriel to rebuild it in a more neoclassical style. The new wing was completed in 1780. Louis XVI was constrained by the worsening financial situation of the kingdom from making major changes to the palace, so that he primarily focused on improvements to the royal apartments. Louis XVI gave Marie Antoinette the Petit Trianon in 1774. The Queen made extensive changes to the interior, and added a theater, the Théâtre de la Reine. She also totally transformed the arboretum planted during the reign of Louis XV into what became known as the Hameau de la Reine. This was a picturesque collection of buildings modeled after a rural French hamlet, where the Queen and her courtiers could play at being peasants. The Queen was at the Petit Trianon in 1789 when she first learned of the beginning of the French Revolution in July 1789. In 1783, the Palace was the site of the signing of three treaties of the Peace of Paris (1783), in which the United Kingdom recognized the independence of the United States. The King and Queen learned of the storming of the Bastille in Paris on July 14, 1789. while they were at the Palace, and remained isolated there as the Revolution in Paris spread. The growing anger in Paris led to the Women's March on Versailles on 5 October 1789. A crowd of several thousand men and women, protesting the high price and scarcity of bread, marched from the markets of Paris to Versailles. They took weapons from the city armory, besieged the Palace, and compelled the King and Royal family and the members of the National Assembly to return with them to Paris the following day. As soon as the royal family departed, the Palace was closed, awaiting their return. In 1792, the Convention, the new revolutionary government, ordered the transfer of all the paintings and sculptures from the Palace to the Louvre. In 1793, the Convention declared the abolition of the monarchy, and ordered all of the royal property in the Palace to be sold at auction. The auction took place between 25 August 1793 and 11 August 1794. The furnishings and art of the Palace, including the furniture, mirrors, baths and kitchen equipment, were sold in seventeen thousand lots. All fleurs-de-lys and royal emblems on the buildings were chambered or chiseled off. The empty buildings were turned into a storehouse for furnishings, art and libraries confiscated from the nobility. The empty grand apartments were opened for tours beginning in 1793, and a small museum of French paintings and art school was opened in some of the empty rooms. When Napoleon Bonaparte became Emperor of the French in 1804, he considered making Versailles his residence, but abandoned the idea because of the cost of the renovation. Prior to his marriage with Marie-Louise in 1810, he had the Grand Trianon restored and refurnished as a springtime residence for himself and his family, in the style of furnishing that it is seen today. In 1815, with the final downfall of Napoleon, Louis XVIII, the younger brother of Louis XVI, became King, and considered returning the royal residence to Versailles, where he had been born. He ordered the restoration of the royal apartments, but the task and cost was too great. Neither he nor his successor Charles X lived at Versailles. The French Revolution of 1830 brought a new monarch, Louis-Philippe to power, and a new ambition for Versailles. He did not reside at Versailles, but began the creation of the Museum of the History of France, dedicated to "all the glories of France", located in the south wing of the Palace, which had been used to house some members of the royal family. The museum was begun in 1833 and inaugurated on 30 June 1837. Its most famous room is the Galerie des Batailles (Hall of Battles), which lies on most of the length of the second floor. Louis Philippe had the far end of the south wing of the Cour Royale demolished and rebuilt to match the Gabriel wing of 1780 opposite, which gave greater uniformity of appearance to the front entrance. The museum project largely came to a halt when Louis Philippe was overthrown in 1848, though the paintings of French heroes and great battles still remain in the south wing. Emperor Napoleon III used the Palace on occasion as a stage for grand ceremonies. One of the most lavish was the banquet that he hosted for Queen Victoria in the Royal Opera of Versailles on August 25, 1855. During the Franco-Prussian War of 1870-1871, the Palace was occupied by the general staff of the victorious German Army. Parts of the chateau, including the Gallery of Mirrors, were turned into a military hospital. The creation of the German Empire, combining Prussia and the surrounding German states under William I, was formally proclaimed in the Hall of Mirrors on January 18, 1871. The Germans remained in the Palace until the signing of the armistice in March 1871. In that month, the government of the new Third French Republic, which had departed Paris during the War for Tours and then Bordeaux, moved into the Palace. The National Assembly held its meetings in the Opera House. The end of the 19th and the early 20th century saw the beginning of restoration efforts at the Palace, first led by Pierre de Nolhac, poet and scholar and the first conservator, who began his work in 1892. The conservation and restoration was interrupted by two world wars, but has continued until the present day. The Palace briefly returned to the world stage in June, 1919, when the Treaty of Versailles, formally ending the First World War, was signed in the Hall of Mirrors. Between 1925 and 1928, the American philanthropist and multi-millionaire John D. Rockefeller gave $2,166,000, the equivalent of about thirty million dollars today, to restore and refurnish the palace. In 1978, parts of the Palace were heavily damaged in a bombing committed by Breton terrorists. The restoration initiatives launched by the Fifth Republic have proven to be perhaps more costly than the expenditures of the palace in the Ancien Régime. Starting in the 1950s, when the museum of Versailles was under the directorship of Gérald van der Kemp, the objective was to restore the palace to its state – or as close to it as possible – in 1789 when the royal family left the palace. Among the early projects was the repair of the roof over the Hall of Mirrors; the publicity campaign brought international attention to the plight of post-war Versailles and garnered much foreign money including a grant from the Rockefeller Foundation. Concurrently, in the Soviet Union (Russia since 26 December 1991), the restoration of the Pavlovsk Palace located 25 kilometers from the center of Leningrad – today's Saint Petersburg – brought the attention of French Ministry of Culture, including that of the curator of Versailles. After the war when Soviet authorities were restoring the palace, which had been gutted by the retreating Nazi forces, they recreated the silk fabrics by using preserved 18th-century remnants. When these results and the high quality achieved were brought to the attention of the French Minister of Culture, he revived 18th-century weaving techniques so as to reproduce the silks used in the decoration of Versailles. The two greatest achievements of this initiative are seen today in wall hangings used in the restoration of the chambre de la reine in the grand appartement de reine and the chambre du roi in the appartement du roi. While the design used for the chambre du roi was, in fact, from the original design to decorate the chambre de la reine, it nevertheless represents a great achievement in the ongoing restoration at Versailles. Additionally, this project, which took over seven years to achieve, required several hundred kilograms of silver and gold to complete. One of the more costly endeavours for the museum and France's Fifth Republic has been to repurchase as much of the original furnishings as possible. Consequently, because furniture with a royal provenance – and especially furniture that was made for Versailles – is a highly sought after commodity on the international market, the museum has spent considerable funds on retrieving much of the palace's original furnishings. In 2003, a new restoration initiative – the "Grand Versailles" project – was started, which began with the replanting of the gardens, which had lost over 10,000 trees during Hurricane Lothar on 26 December 1999. One part of the initiative, the restoration of the Hall of Mirrors, was completed in 2006. Another major project was the further restoration of the backstage areas Royal Opera of Versailles, which was completed in 2009. The Palace of Versailles is owned by the French state. Its formal title is the Public Establishment of the Palace, Museum and National Estate of Versailles Since 1995, it has been run as a Public Establishment, with an independent administration and management supervised by the French Ministry of Culture. The current Chairperson of the Public Establishment is Catherine Pégard. The palace was largely completed by the death of Louis XIV in 1715. The eastern facing palace has a U-shaped layout, with the corps de logis and symmetrical advancing secondary wings terminating with the Dufour Pavilion on the south and the Gabriel Pavilion to the north, creating an expansive cour d'honneur known as the Royal Court (Cour Royale). Flanking the Royal Court are two enormous asymmetrical wings that result in a facade of 402 metres (1,319 ft) in length. Encompassing 67,000 square metres (721,182 sq ft) the palace has 700 rooms, more than 2,000 windows, 1,250 fireplaces and 67 staircases. The façade of Louis XIII's original château is preserved on the entrance front. Built of red brick and cut stone embellishments, the U-shaped layout surrounds a black-and-white marble courtyard. In the center, a 3-storey avant-corps fronted with eight red marble columns supporting a gilded wrought-iron balcony is surmounted with a triangle of lead statuary surrounding a large clock, whose hands were stopped upon the death of Louis XIV. The rest of the façade is completed with columns, painted and gilded wrought-iron balconies and dozens of stone tables decorated with consoles holding marble busts of Roman emperors. Atop the mansard slate roof are elaborate dormer windows and gilt lead roof dressings that were added by Hardouin-Mansart in 1679–1681. The construction in 1668–1671 of Le Vau's enveloppe around the outside of Louis XIII's red brick and white stone château added state apartments for the king and the queen. The addition was known at the time as the château neuf (new château). The grands appartements (Grand Apartments, also referred to as the State Apartments) include the grand appartement du roi and the grand appartement de la reine. They occupied the main or principal floor of the château neuf, with three rooms in each apartment facing the garden to the west and four facing the garden parterres to the north and south, respectively. The private apartments of the king (the appartement du roi and the petit appartement du roi) and those of the queen (the petit appartement de la reine) remained in the château vieux (old château). Le Vau's design for the state apartments closely followed Italian models of the day, including the placement of the apartments on the main floor (the piano nobile, the next floor up from the ground level), a convention the architect borrowed from Italian palace design. The king's State Apartment consisted of an enfilade of seven rooms, each dedicated to one of the known planets and their associated titular Roman deity. The queen's apartment formed a parallel enfilade with that of the grand appartement du roi. After the addition of the Hall of Mirrors (1678–1684) the king's apartment was reduced to five rooms (until the reign of Louis XV, when two more rooms were added) and the queen's to four. The Salon of Abundance was the antechamber to the Cabinet of Curios (now the Games Room), which displayed Louis XIV's collection of precious jewels and rare objects. Some of the objects in the collection are depicted in René-Antoine Houasse's painting Abundance and Liberality (1683), located on the ceiling over the door opposite the windows. This salon was used for serving light meals during evening receptions. The principal feature in this room is Jean Warin's life-size statue of Louis XIV in the costume of a Roman emperor. On the ceiling in a gilded oval frame is another painting by Houasse, Venus subjugating the Gods and Powers (1672-1681). Trompe l'oeil paintings and sculpture around the ceiling illustrate mythological themes. The Salon of Apollo was the royal throne room under Louis XIV, and was the setting for formal audiences. The eight-foot high silver throne was melted down in 1689 to help pay the costs of an expensive war, and was replaced by a more modest throne of gilded wood. The central painting on the ceiling, by Charles de la Fosse, depicts the Sun Chariot of Apollo, the King's favorite emblem, pulled by four horses and surrounded by the four seasons. The apartments of the King were the heart of the chateau; they were in the same location as the rooms of Louis XIII, the creator of the chateau, on the first floor (second floor US style). They were set aside for the personal use of Louis XIV in 1683. He and his successors Louis XV and Louis XVI used these rooms for official functions, such as the ceremonial lever ("waking up") and the coucher ("going to bed") of the monarch, which were attended by a crowd of courtiers. 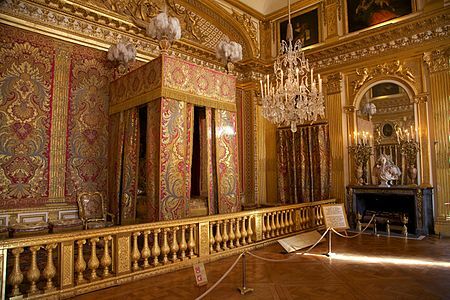 The King's apartment was accessed from the Hall of Mirrors from the Oeil de Boeuf antechamber past the Guardroom and the Grand Couvert, the ceremonial room where Louis XIV often took his evening meals, seated alone at a table in front of the fireplace. His spoon, fork, and knife were brought to him in a golden box. The courtiers could watch as he dined. The King's bedchamber had originally been the State Drawing Room and had been used by Queen Marie-Theresa, but after her death in 1701 Louis XIV took it over to use as his own bedroom and died there on September 1, 1715. Both Louis XV and Louis XVI continued to use the bedroom for their official awakening and going to bed. On October 6, 1789, from the balcony of this room Louis XVI and Marie-Antoinette, joined by the Marquis de Lafayette, looked down on the hostile crowd in the courtyard, shortly before the King was forced to return to Paris. The petit appartement de la reine is a suite of rooms that were reserved for the personal use of the queen. Originally arranged for the use of the Marie-Thérèse, consort of Louis XIV, the rooms were later modified for use by Marie Leszczyńska and finally for Marie-Antoinette. The Queen's apartments and the King's Apartments were laid out on the same design, each suite having seven rooms. Both suites had ceilings painted with scenes from mythology; the King's ceilings featured male figures, the Queen's featured females. The Galerie des Glaces (Hall of Mirrors), is perhaps the most famous room in the château of Versailles. It took the place of the rooftop terrace overlooking the gardens which formerly connected the apartments of the King and Queen. The construction of the room began in 1678 and finished in 1689. The gallery is more than 70 metres (230 ft) long, and it is lined with 17 wide arcaded mirrors, designed to match and reflect the windows opposite facing the gardens. Charles Le Brun painted thirty scenes of the early reign of Louis XIV on the ceiling. The centerpiece is a painting of the King titled, "The King Governing Alone". It shows Louis XIV, facing the powers of Europe, turning away from his pleasures to accept a crown of immortality from Glory, with the encouragement of Mars. The Royal Opera of Versailles was originally commissioned by Louis XIV in 1682 and was to be built at the end of the North Wing with a design by Mansart and Vigarani. However, due to the expense of the King's continental wars, the project was put aside. The idea was revived by Louis XV with a new design by Ange-Jacques Gabriel in 1748, but this also was temporarily put aside. The project was revived and rushed ahead for the planned celebration of the marriage of the Dauphin, the future Louis XVI, and Marie-Antoinette. For economy and speed, the new opera was built almost entirely of wood, which also gave it very high quality acoustics. The wood was painted to resemble marble, and the ceiling was decorated with a painting of the Apollo, the god of the arts, preparing crowns for illustrious artists, by Louis Jean-Jacques Durameau. The sculptor Augustin Pajou added statuary and reliefs to complete the decoration. The new Opera was inaugurated on May 16, 1770, as part of the celebration of the royal wedding. Shortly after becoming King in 1830, Louis Philippe I decided to transform the Palace, which was empty of furnishings and in poor repair, into a museum devoted to "All the Glories of France," with paintings and sculpture depicting famous French victories and heroes. The walls of the apartments of the courtiers and lesser members of the royal family on the first floor (second floor U.S. style) were demolished, and turned into a series of several large galleries: the Coronation Room, which displays the celebrated painting of the coronation of Napoleon I by Jacques-Louis David; the Hall of Battles; commemorating French victories with large-scale paintings; and the 1830 room, which celebrated Louis-Philippe's own coming to power in the French Revolution of 1830. Some paintings were brought from the Louvre, including works depicting events in French history by Philippe de Champaigne, Pierre Mignard, Laurent de La Hyre, Charles Le Brun, Adam Frans van der Meulen, Nicolas de Largillière, Hyacinthe Rigaud, Jean-Antoine Houdon, Jean-Marc Nattier, Élisabeth Vigée Le Brun, Hubert Robert, Thomas Lawrence, Jacques-Louis David, and Antoine-Jean Gros. Others were commissioned especially for the museum by prominent artists of the early 19th century, including Eugène Delacroix, who painted Saint Louis at the French victory over the British in the Battle of Taillebourg in 1242. Other painters featured include Horace Vernet and François Gérard. 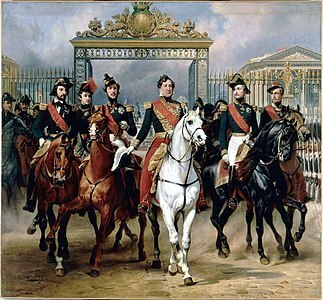 A monumental painting by Vernet features Louis Philippe himself, with his sons, posing in front of the gates of the Palace. André Le Nôtre began transforming the park and gardens of Versailles in the early 1660s. They are the finest example of the jardin à la française, or the French formal garden. They were originally designed to be viewed from the terrace on the west side of the palace, and to create a grand perspective that reached to the horizon, illustrating the king's complete dominance over nature. The features closest to the Palace are the two water parterres, large pools which reflect the facade of the palace. These are decorated with smaller works of sculpture, representing the rivers of France, which are placed so as not to interfere with the reflections in the water. Down a stairway from the Parterre d'Eau is the Latona Fountain, created in 1670, illustrating the story of Latona taken from the Metamorphoses of Ovid. According to the story, when the peasants of Lycia insulted Latona, the mother of Apollo and Diana, the god Jupiter transformed the peasants into frogs. The fountain was begun in 1670 by Le Nôtre, then enlarged and modified by Hardouin-Mansart, who placed the statue of Latona atop a marble pyramid. The South Parterre is located beneath the windows of the queen's apartments and on the roof of the Orangerie. It is decorated with box trees and flowers in arabesque patterns. The underground orangerie was designed to hold over a thousand citrus fruit, palms and oleanders, and other southern-climate trees during winter. They are taken out into the gardens from mid-May until mid-October. 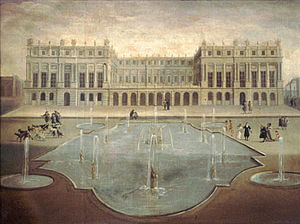 Supplying water for the fountains of Versailles was a major problem for the royal government. The 18th-century waterworks at Marly— the Machine de Marly that fed the fountains— was possibly the biggest mechanical system of its time. The water came in from afar on monumental stone aqueducts which have long ago fallen into disrepair or been torn down. Some aqueducts, such as the unfinished Canal de l'Eure, which passes through the gardens of the Château de Maintenon, were never completed for want of resources or due to the exigencies of war. Despite enormous investment in canals and machinery for hoisting water, Versailles never had a sufficient water supply for its hundreds of fountains. When the King promenaded in the gardens, fountains were turned on only when the King was approaching them, and turned off after he departed. Today, only a few fountains are supplied with water, and only operate on a very limited schedule. The largest part of the garden is divided into geometric bosquets, compartment-like groves; eight on the north side of the garden, and six to the south. The bosquets were created for Louis XIV between 1680 and 1690. They were bordered with high trees and carefully trimmed in cubic forms to resemble rooms with walls of greenery. Each bosquet had its own theme and fountains, statuary, grottoes, and other decoration. Some were highly formal, like Hardouin-Mansart's Bosquet de la Colonnade, with a circle of columns alternating with fountains, while others imitated nature. They were often used for concerts or theatrical performances. 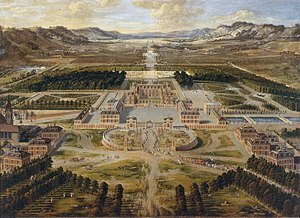 Some of the early groves were altered beyond recognition by later monarchs, but the most famous bosquets, Le Nôtre's Salle de Bal (literally, "ballroom"), also known as the Bosquet des Rocailles (c. 1685), and Hardouin-Mansart's Bosquet de la Colonnade, have both been restored to the way they were under Louis XIV. Other notable groves include Les Dômes, the Bosquet d'Encelade (after Enceladus, c. 1675), the Théâtre d'Eau (Water Theater), and the Bains d'Apollon (Baths of Apollo). Some are now decorated with contemporary works of art. The palace still serves political functions. Heads of state are regaled in the Hall of Mirrors; the bicameral French Parliament—consisting of the Senate (Sénat) and the National Assembly (Assemblée nationale)—meet in joint session (a congress of the French Parliament) in Versailles to revise or otherwise amend the French Constitution, a tradition that came into effect with the promulgation of the 1875 Constitution. For example, the Parliament met in joint session at Versailles to pass constitutional amendments in June 1999 (for domestic applicability of International Criminal Court decisions and for gender equality in candidate lists), in January 2000 (ratifying the Treaty of Amsterdam), and in March 2003 (specifying the "decentralized organization" of the French Republic). Once Louis XIV embarked on his building campaigns, expenses for Versailles became more of a matter for public record, especially after Jean-Baptiste Colbert assumed the post of finance minister. Expenditures on Versailles have been recorded in the compendium known as the Comptes des bâtiments du roi sous le règne de Louis XIV and which were edited and published in five volumes by Jules Guiffrey in the 19th century. These volumes provide valuable archival material pursuant to the financial expenditure on all aspects of Versailles such as the payments disbursed for many trades as varied as artists and mole catchers. II. 129 21 March to Sr. Jehannot de Bartillay 4,970 livres 12 sols for the delivery to Sr. Lois and de Villers silversmiths for, with 136,457 livres 5 sol to one and 25,739 livres 10 sols to another, making the 38 balusters, 17 pilasters, the base and the cornice for the balustrade for the château of Versailles weighing 4,076 marc at the rate of 41 livres the marc[c] including 41 livres 2 sols for tax: 4,970 livres 12 sols. Accordingly, the silver balustrade, which contained in excess of one ton of silver, cost in excess of 560,000 livres. It is difficult – if not impossible – to give an accurate rate of exchange between 1682 and today. [d] However, Frances Buckland provides valuable information that provides an idea of the true cost of the expenditures at Versailles during the time of Louis XIV. In 1679, Mme de Maintenon stated that the cost of providing light and food for twelve people for one day amounted to slightly more than 14 livres. In December 1689, to defray the cost of the War of the League of Augsburg, Louis XIV ordered all the silver furniture and articles of silver at Versailles – including chamber pots – sent to the mint to be melted. Estimates of the amount spent to build Versailles are speculative. An estimate in 2000 placed the amount spent during the Ancien Régime as US$2 billion, this figure being, in all probability, an under-evaluation. France's Fifth Republic expenditures alone, directed to restoration and maintenance at Versailles, may have surpassed those of the Sun King. Marie Antoinette (2006) is a film written and directed by Sofia Coppola and starring Kirsten Dunst. It is based on the life of Queen Marie Antoinette in the years leading up to the French Revolution, filmed on location at the Palace of Versailles. ^ Under Louis XIV the garden and park were enlarged further, eventually reaching 2,473 ha; they are now only 815 ha (Hoog 1996, p. 372). ^ Annual Report of the Regional Committee on Tourism of the Ile-de-France Region, cited in La Croix, 22 February 2018. ^ a b Hoog 1996, p. 369. ^ Lacaille 2012, p. 3. ^ a b c Lacaille 2012, pp. 4-5. ^ Garriques 2001, p. 274. ^ Constans 1998, p. 24. ^ a b "Palace of Versailles | palace, Versailles, France". Encyclopedia Britannica. Retrieved 28 August 2017. ^ Hoog 1996, p. 370. ^ Lacaille 2012, p. 3-6. ^ a b Lacaille 2012, p. 3=6. ^ Lacaille 2012, p. 8. ^ a b Lacaille 2012, pp. 15-20. ^ Tony Spawforth. Versailles. p. 9. ^ Tony Spawforth. Versailles. p. 22. ^ Lacaille, 2012 & pages 16-17. ^ Lacaille, 2012 & pages 18. ^ a b Lacaille 2012, p. 19. ^ Tony Spawforth. Versailles. p. 244. ^ Lacaille 2012, p. 12. ^ Lacaille 2012, p. 20. ^ Lacaille, 2013 & page 13. ^ "History of Art". Visual Arts Cork. Retrieved 10 August 2016. ^ "Palace of Versailles". Dimensions Info. Retrieved 10 August 2016. ^ Ayers 2004, pp. 334–335, 337. ^ a b Saule 2013, p. 20. ^ Saule 2013, p. 22. ^ Saule 2013, p. 25. ^ Saule 2013, p. 23. ^ a b c Saule 2016, p. 32. ^ a b Saule 2013, p. 30. ^ Saule 2013, p. 31. ^ Saule 2013, p. 16. ^ Saule 2013, p. 60. ^ Saule 2013, pp. 18-19. ^ Saule 2013, pp. 18–19. ^ Berger 1985b, p. 5. ^ a b Saule 2013, p. 68. ^ a b Saule 2013, p. 73. ^ a b c Saule 2013, p. 78-85. ^ Saule 2014, p. 92. ^ Associated Press, Breaking tradition, Sarkozy speaks to parliament (22 June 2009). ^ Associated Press, The Latest: US Basketball Player James Not Going to France (16 November 2015). ^ Associated Press, The Latest: Brother Linked to Paris Attacks in Disbelief (16 November 2015). ^ Francois Hollande: 'France is at war', CNN (16 November 2015). Blondel, Jacque-François (1752–1756). Architecture françoise, ou Recueil des plans, élévations, coupes et profils des églises, maisons royales, palais, hôtels & édifices les plus considérables de Paris. 4 vols. Paris: Charles-Antoine Jombert. Buckland, Frances (May 1983). "Gobelin tapestries and paintings as a source of information about the silver furniture of Louis XIV". The Burlington Magazine. 125 (962): 272–283. Constans, Claire (1998). Versailles: Absolutism and Harmony. New York: The Vendome Press. ISBN 9782702811252. Garrigues, Dominique (2001). Jardins et jardiniers de Versailles au grand siècle. Seyssel: Champ Vallon. ISBN 9782876733374. Kemp, Gerard van der (1976). "Remeubler Versailles". Revue du Louvre. 3: 135–137. Lacaille, Frédéric (2012). Versailles - 400 ans d'histoire. Paris: Gallimard. ISBN 978-2-07-044430-4. Leloup, Michèle (7 August 2006). "Versailles en grande toilette". L'Express. Archived from the original on 15 February 2008. ——— (February 1989). "L'ameublement de la chambre de Louis XIV à Versailles de 1701 à nos jours". Gazette des Beaux-Arts (6th ed.). 113: 79–104. Nolhac, Pierre de (1898). La création de Versailles sous Louis Quinze. Paris: H. Champion. Oppermann, Fabien (2004). Images et usages du château de Versailles au XXe siècle (Thesis). École des Chartes. Wikimedia Commons has media related to Palace of Versailles.